One of the most important passages in the Scriptures, First Corinthians 13 is often read and rarely followed. Medieval theologian, John Chrysostom, was called the “golden-mouthed” one, for the eloquence of his preaching. His reputation extended from his native East to the Christian West, and he is remembered today as a Church Father for the entire Church. 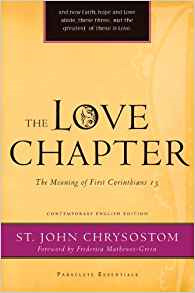 Now available in a popular contemporary English translation for the first time, The Love Chapter makes available these most important reflections of St. John, on a most important portion of the New Testament.